Arlington Machine and Fabrication can also provide your business or facility with crane and rigging service. B.C. 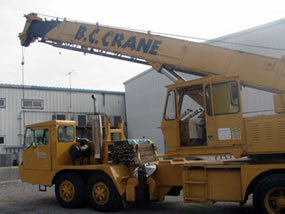 Crane’s experienced and knowledgeable crane operators have all of the equipment and resources to handle any job. We can save your business money on large scale projects by providing our very own 35 ton crane or tackle any other heavy lifting jobs your business may need. If your project requires something less heavy duty we also have 12 ton boom trucks available.